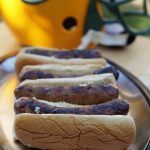 Beer Brat Recipe - Brats simmered in beer and onions and finished off on the grill. Perfect for tailgating! Braise the brats. Add the brats to a deep frying pan or large pot set on medium heat. To the brats add the beer, beef broth, onion, garlic and water. Bring to a boil & reduce to simmer. Occasionally turn the brats. Cook them for 30-45 minutes until they are completely cooked thru. Braising them will keep them juicy and flavorful. Grill the Beer Brats over an open grill making sure to get good grill marks. Build your brat with a hotdog bun, topped with a brat, sauerkraut and german mustard. Enjoy!